Parrot Beak Drum Handling System Archives - Liftomatic™ Material Handling Inc.
1947 was a big year. Gregory Peck and Rosalind Russell won Golden Globes. The movie, “The Best Years of our Lives” was selected as Best Picture. The International Monetary Fund began operations. The largest group of sunspots ever recorded happened in ’47. Jackie Robinson became the first African American to play major league baseball. And explorer Thor Heyerdahl sailed his famed craft the “Kon-Tiki” from Peru to Polynesia. Also in 1947, two guys armed with an idea to improve productivity, safety and efficiency in drum handling technology, started Liftomatic Material Handling, Inc. The product of necessity, marketing and engineering acumen, these two gentlemen saw a need – and filled it. One a plant manager and engineer of Norwegian descent, the other a salesmen of mechanical office equipment who hailed from Sweden. 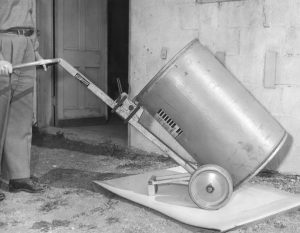 Together, they built on a concept that included a two wheel hand-truck with a positive grip mechanism (later to be named the “Parrot-Beak®”) which would hold a 55-gallon drum during transport and placement. The first 6 hand trucks were sold to the DuPont corporation in Chicago in the spring of 1947. From those early developments to the advent and nationwide adoption of the forklift truck during the early stages of the Korean conflict, Liftomatic products kept pace with the times. Increasing popularity for unitized handling concepts, bulk transfer, cubic storage and warehousing efficiency saw the Liftomatic product line grow from 1 to over 20 products in just 10 years. During the last 40 years, we’ve tried to stay true to the founders’ mission: Build safe, durable products with input from customers and always remember that “The quality is remembered long after the price is forgotten”. Today, the Parrot-Beak® line of products includes more than 40 models in 120 configurations. Whether your operations require handling 1 drum per week or a thousand per day, there’s a Liftomatic model suited to your requirements. We look forward to bringing you some additional history of Liftomatic products as we go through this 70th anniversary year. We also look forward to serving your operations for the next 70. As always, we thank you for your trust in Liftomatic. Will You be Attending ChemEdge 2014? From August 19-22, Liftomatic will be among hundreds of participants at the 2014 ChemEdge event in Nashville, TN (formerly the NACD Operations Seminar & Trade Show – OPSEM). The event brings together manufacturers and distributors, purchasing executives, operations managers, and other professionals involved in the chemical distribution industry. ChemEdge is a must-attend event for those interested in learning about new products and services related to the chemical sector. There will be numerous educational sessions and one-on-one meetings to ensure that everyone comes away with more industry knowledge than they had going into the show. The event also includes opportunities to network in a more informal setting, including a golf outing, dinners, an ice cream social, and more (we’re looking forward to hitting the links!). On the show floor, Liftomatic will be exhibiting at Booth 605. We have a wide range of material handling equipment for the chemical industry and are eager to show off our solutions at the show. Our products include custom drum handlers to suit just about any need. Our patented parrot beak drum handling system is a safe option for transporting barrels in a warehouse. Unlike a traditional forklift, which simply lifts objects from the bottom, our parrot beak drum handling equipment stabilizes drums from the top to minimize spills and other accidents. This can reduce product waste and protect staff members who are transporting hazardous materials. To learn more about our drum handling systems designed for the chemical industry, visit us at ChemEdge so we can help you choose the right options for your needs. If you’re not at the show, you can also request a quote online.